ProDocument is the ultimate file and document manager for Clarion! VIP ... New versions of ImageEx, ProScan and ProImage are now available that work directly with ProDocument! ProDocument can open up new dimensions for these tools in your applications since it makes it possible for any number of scans or images to be linked to the parent record (or just in a list of files not related to any record). New DEMO application (updated 7-21-2017) available that shows integration of ImageEx, ProScan and ProImage - click here! NEW - See our ProDocument Template at work on ClarionLive ( webinar #411 ) click here. In a hurry? - Click here to Buy ProDocument Now! Fast to install and easy to configure, ProDocument makes it a snap for you to add file and document management to your Clarion application. The demo app includes procedures for a simple document manager that you can use to jump start your integration. It also includes a simple File Repository example that can be used the same way. A more complex multilevel example showing tracking documents is also being developed. ProDocument works with all versions of Clarion from C6.x to C10. Both the Clarion ABC and Legacy template chains are supported. From a simple list of files managed by your program, to a complex related set of documents (such as tracking International Shipping Documents for each line item of an invoice and being able to see them on a grouped related basis), ProDocument is the only tool you need to get the job done! 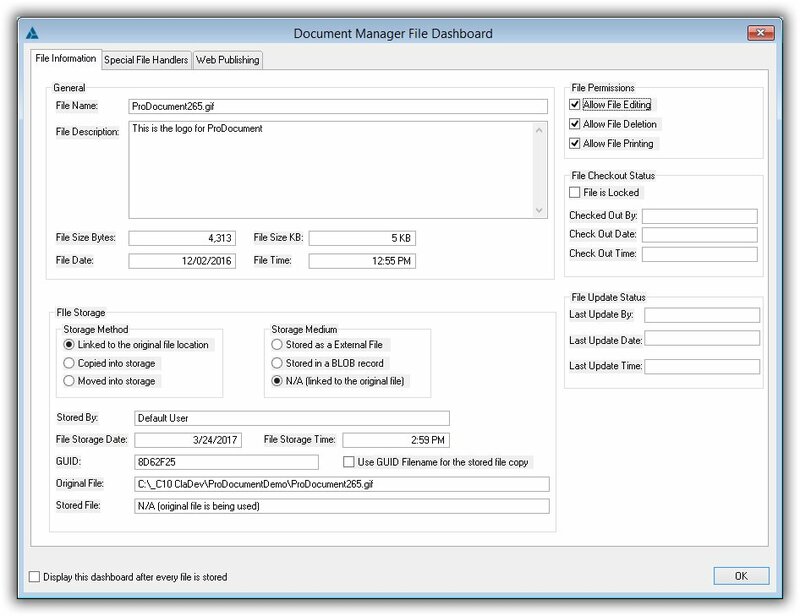 The document manager can use links to original files, copies of original files, or move the original files into storage. A combination of these selections can also be used and selected by the user at runtime. Files can be stored either as external files, or in BLOB storage. 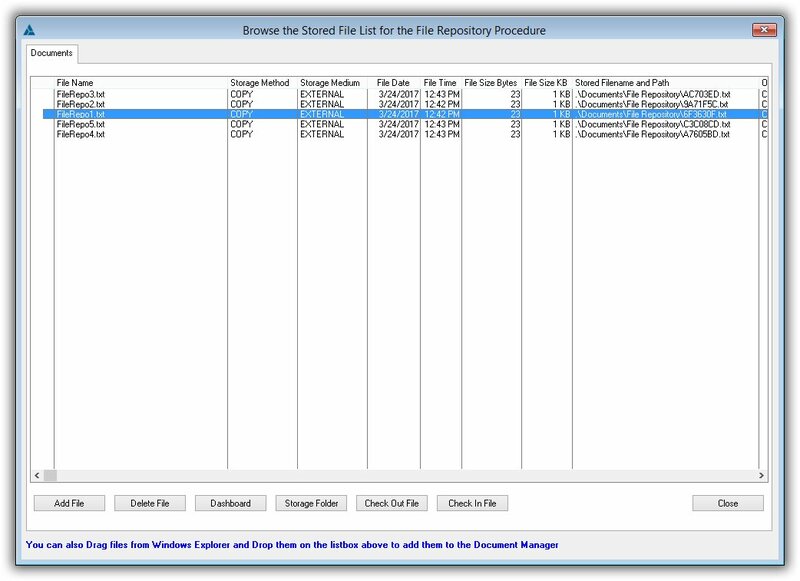 If external storage is used, ProDocument can create compressed folders with the Windows API. This safe built in the OS compression allows you to have the benefits of ZIP file storage without the need to UNZIP files into a temporary folder before you can access them. 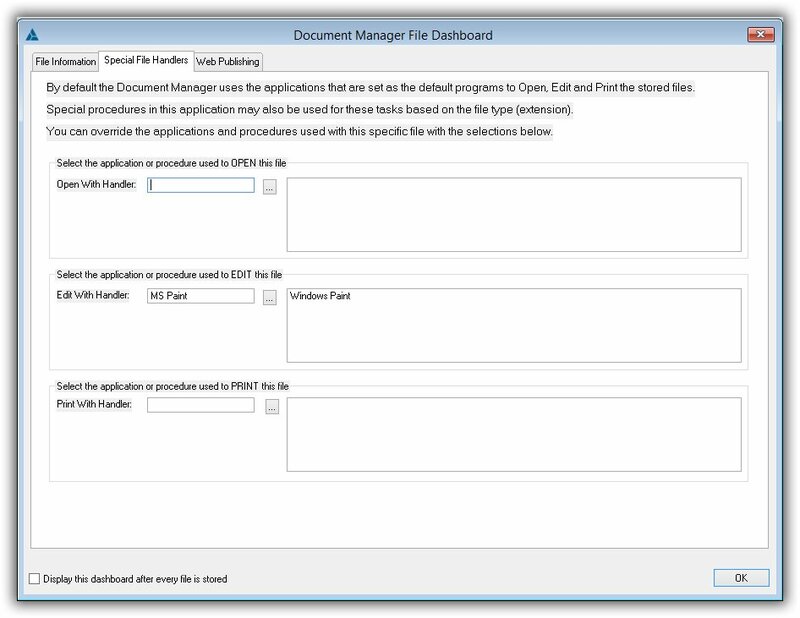 Multiple users can add, open, delete or edit files as well as check them in and out of the document manager. You can use standard security tools such as SecWin to enable or disable options and features as needed. By default ProDocument will OPEN, EDIT and PRINT files using the application that users have associated with that file type in Windows. 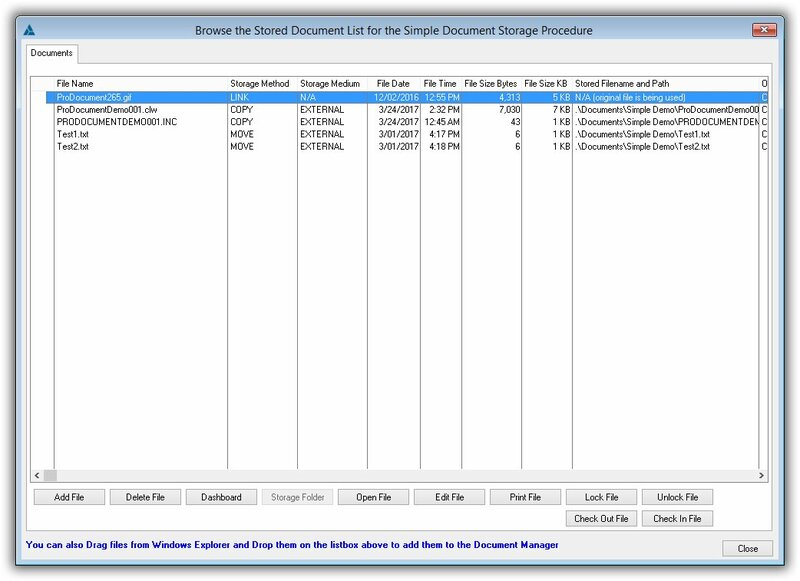 ProDocument also allows the users to override the handlers for individual files or use a rules based system to designate that certain file types are always handled by a specific application. 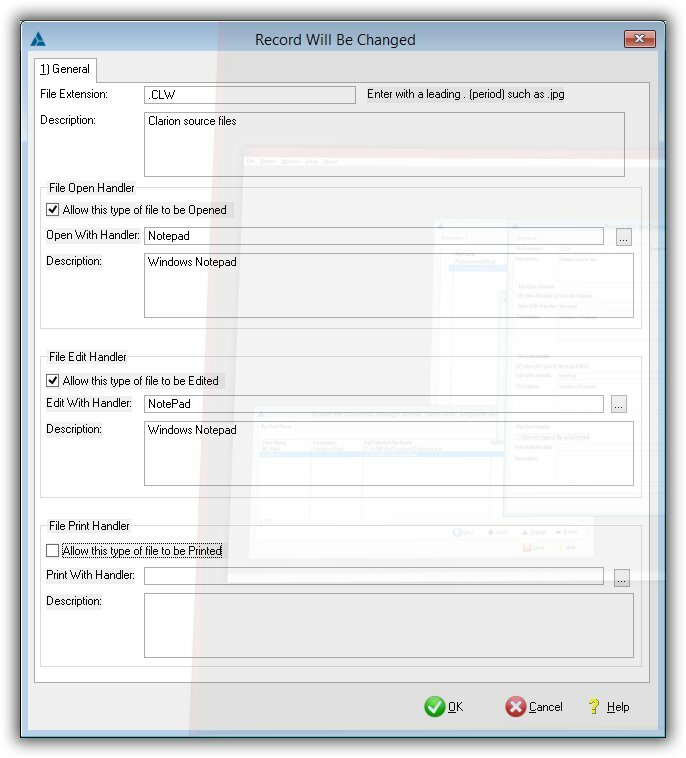 This gives you and your users total control over file actions. You can also have procedures that are designated as built-in handlers for certain file types in your application (such as image or PDF file viewers). ProDocument will create automatic GUID identifiers for each file using the Windows API (you can also use your own if you prefer). The template also allows for GUID filenames to be used when storing external files. This eliminates the potential of naming conflicts and when you check out, edit or print a file the original name is always used. ProDocument has built in support for NetTalk webservers (and soon for H5). It ships with a pre-configured NetTalk webserver so that you can “serve” stored files on the LAN or across the Internet (if your LAN allows it). You can also easily add it to your existing NetTalk servers. Note that while NetTalk normally has a learning curve adding ProDocument support to it is a “zero hand coding” solution. Just add the extension template to the NetTalk server, select your settings and you are ready to publish! You can even control which files get published on the server and use “short URLs” that are direct links to the files (instead of passing the filename as a parameter to an internal procedure). Report archive extensions are being added to the standard Clarion report previewer as well as other popular report previewers. This means that you can archive reports as they are created, then “replay” the stored report directly from the ProDocument stored files. Support is also being added for other popular templates such as our ProScan and ProImage templates. This direct support will take these templates to another level of usefulness as it changes the entire paradigm of how they store and use files. Support is also being added to convert stored files to PDF for publishing on the LAN, Internet or e-mailing. Note that more screen shots and information about the template will be posted soon. ProDocument ships with a pre-configured “Dashboard” that you can import into your application and adjust to suit your needs. The Dashboard provides “at a glance” information about a stored or linked file. It also allows the user to override the default Windows or built-in handlers with specific programs to OPEN, EDIT or PRINT the stored file. The users can even configure different applications to handle OPEN, EDIT and PRINT operations and use them on a case by case basis. Users can also setup “rules” by file types that determine which handlers will be used to support that type of file and operation. Note that you can have multiple instances of ProDocument in your application and each one can store external files in different folders. Then while all of the stored file data is in one main table the results are filtered down so that you only see files related to that group of data! You can download a full working demo of ProDocument with sections showing the integration of ImageEx, ProScan and ProImage - plus an integrated NetTalk document server here. NOTE: If you downloaded the demo before, please download and install it again to get the latest update. Use one of the options below to purchase ProDocument for $399.95. ** Both template chains are supported from the same template, but if you use Legacy code this is your chance to “vote” with your wallet for us to continue to develop and support Legacy chain templates.